New research by Global Justice Now and Corporate Europe Observatory shows that 91 per cent of meetings held by UK trade ministers (from October 2016 to June 2017) and 70 per cent of meetings held by UK Brexit ministers have been with business, too often big business interests. 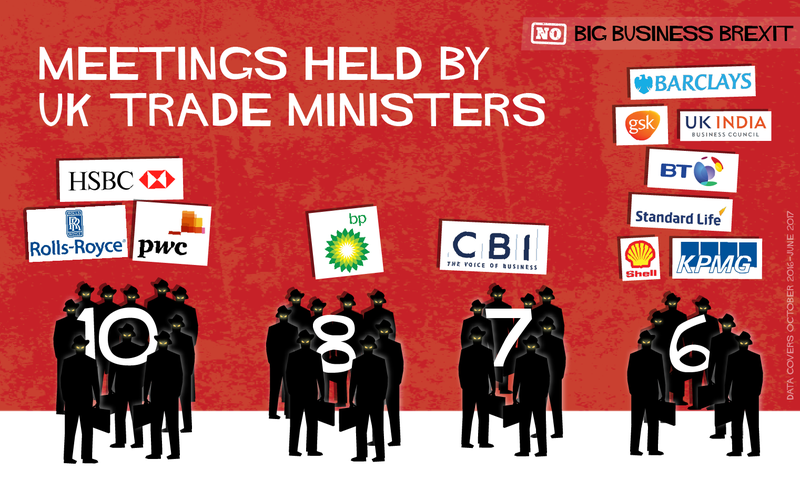 This corporate bias in ministerial access is part of an ongoing trend that we have previously highlighted for both Brexit and trade ministers. Even though Brexit is the biggest political issue facing the UK for generations, civil society in the form of NGOs, trade unions, and citizens’ groups, have had far less face-time with ministers to input into the UK’s Brexit position and to shape its post-EU membership approach to overseas trade. For ministers in the UK’s Department for Exiting the European Union (DEXEU), finance has been the issue most lobbied on, with at least 56 meetings held in 9 months on this issue, which is 17 per cent of the total. Almost all meetings on finance were held with corporate interests. To put this into context, more meetings were held on finance with corporate lobbyists than with all of civil society, on any issue, in the period studied. 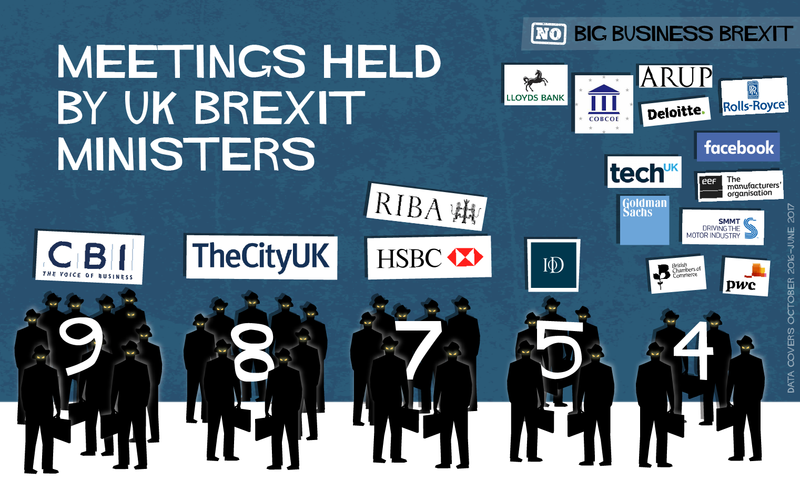 This is reflected in the presence of TheCityUK (8 meetings) and HSBC (7 meetings), plus Goldman Sachs and Lloyds Bank (4 meetings each), among DEXEU ministers’ most frequent lobbyists. Other DEXEU top lobbyists include: the Confederation of British Industry (9 meetings), the Institute of Directors (5 meetings), British Chambers of Commerce (4 meetings), and COBCOE, which represents British chambers of commerce across Europe and their business members (4 meetings). Manufacturers feature prominently with the trade association EEF, the car industry’s trade association SMMT, and Rolls Royce all with 4 meetings each. Audit firms PriceWaterhouseCoopers and Deloitte, plus Facebook, Arup and TechUK also had 4 meetings each. The Royal Institute of British Architects also makes it onto the list of DEXEU ministers’ most frequent lobbyists with 7 meetings during the period studied. Data available here. Finance sector and audit firms also figure prominently in the list of top lobbyists at the UK’s Department for International Trade, with HSBC and PriceWaterhouseCoopers on 10 meetings each, and Barclays, KPMG and Standard Life (6 meetings each) all making the list. Also featuring prominently are the oil and gas firms BP (8 meetings) and Shell (6 meetings), which activists are likely to see as ominous for the UK’s post-Brexit climate and environment policy. Other firms in the top lobbyists list include Rolls Royce (10 meetings) and the pharmaceutical giant GlaxoSmithKline (6 meetings). Data available here. For both DEXEU and DIT, these figures on corporate bias may even underestimate the true situation, especially considering DEXEU’s use of roundtable meetings on finance and other issues which appear to mask the true extent of interactions with business interests. And there is no transparency by DEXEU or DIT on the lobby meetings held by non-ministerial officials. Additionally, there is an absence of transparency regarding the content of these lobby meetings. We do not know who is pushing which positions - or how ministers are responding. No minutes or position papers from these meetings have been released under freedom of information and DEXEU officials refused our request by calling it a “fishing expedition”. Yet it seems to us that there is an obvious and legitimate public interest in knowing what is being discussed by Big Finance and other corporate interests, especially when civil society is getting far less access. The 311 meetings between Michel Barnier, the EU’s chief negotiator on Brexit, and / or the Brexit taskforce of officials, and lobbyists, between October 2016 and November 2017, follow a similar pattern to the UK meetings, with business interests dominating. Seventy two percent of these meetings were with corporate interests, with finance followed by food / agriculture dominating (as in the UK) with 51 meetings (16 percent of total) and 49 (15.8 percent) meetings respectively. As in the UK, minutes and names of those individuals attending the meetings were all withheld. When taking office, Commission President Juncker instructed fellow Commissioners “seek to ensure an appropriate balance and representativeness in the stakeholders they meet”. It is clear that this aspiration is not being followed, either by Commissioners or by the EU’s Brexit negotiators. With 2018 set to see the start of Brexit transition talks, plus negotiations on trade and other substantive matters of public interest, this corporate dominance is worrying. Data available here. Ultimately, whatever is being discussed in secret in the corridors of power, it is fundamentally unfair that big firms and trade associations representing major corporate interests are getting so much more access to Brexit and trade ministers than anybody else. Brexit will have impacts on everyone in the UK, as well as many people in the EU. Indeed, David Davis, the minister in change of the Brexit process, has not even met groups representing EU migrants in the UK and British people in the EU, arguably the people that have most to lose from Brexit. This research shows that this corporate dominance in terms of who meets with Brexit and trade ministers must end if we are to avoid a Brexit dictated by a few powerful business figures. We have collated these figures for DEXEU and DIT using the publicly-available lists of ministerial lobby meetings. EU data was compiled from online information and several access to document requests. It is worth noting that the official data may contain duplications. Data for DEXEU, DIT, and EU lobby meetings can be accessed online. Our previous work analysing the lobby meetings of DEXEU and DIT can also be accessed online.